1. Give em' your access password. 2. Keep it out of their reach. 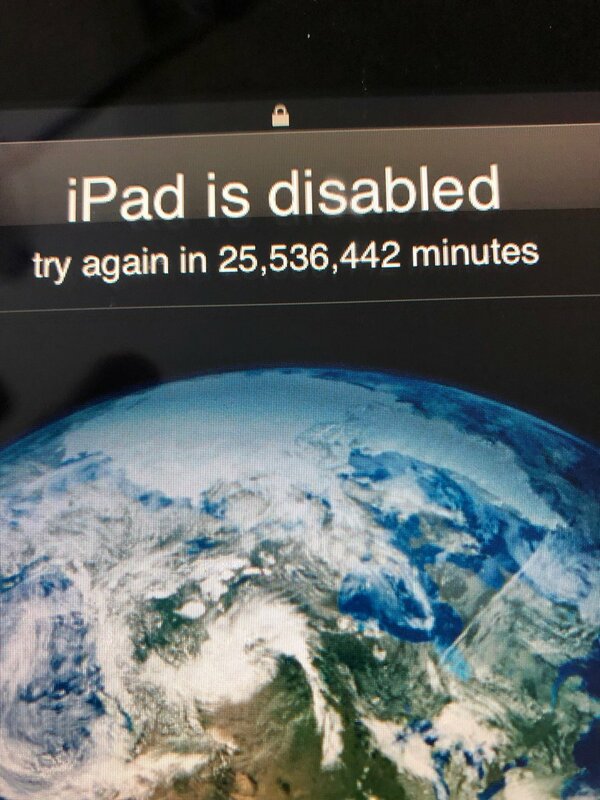 Evan Osnos had to learn the hard way after his toddler inserted too many incorrect passwords in attempt to access the iPad, to which resulted to locked Evan out of his own iPad for the next 48 years! To most of us, we wonder if that was even possible -- but now we know it is. Evan had to turn to the world’s biggest tech support system, Twitter. Common knowledge for tech users is that after 5 wrong attempts, you'll be locked out for a minute, but Evan's son had made 10 wrong attempts -- leading to a massive long wait of 25.5 Million minutes! Entering a sixth incorrect code delays the next guess for five minutes, a seventh to 15 minutes, and so on until at the tenth attempt, the device is disabled. At the tenth incorrect attempt it will automatically erase the device. The good news is that the screen message about being locked out for decades is wrong – there is a way to recover the device – although the order of button presses required varies slightly depending on which version of iOS or iPhone/iPad is involved. Now we can thank God for the brains of the 21st century tech engineers -- else a whole lotta money would've gone to waste just to buy another device. Apple comes to the rescue by explaining the procedure on its support site. You're required to connect to your iTunes account to initiate a restore. This assumes users will have automatic backup to iCloud turned on – Settings > [your name] > iCloud > iCloud Backup. So for future reference, highly advised that you keep your gadget out of reach from young ones -- y'know la at a young age, they have the "never say die" mentality and "buat sampai dapat".